Giving yourself permission to fail can make it easier for you to succeed. This week Janine and Shannon take a deep dive into this liberating concept, one that was pretty foreign to happy-go-lucky Janine. Shannon’s blog posts about no failure, only feedback, her first solo mountain climb and how to fall. I love your podcast! I’ve been listening to them for a few months now, and I always learn something. 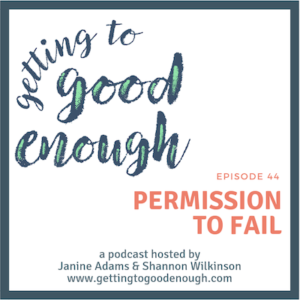 This one on permission to fail was especially freeing for me! I love how you defined success and failure, and I am changing my mindset going forward to adopt your philosophy! I am very excited to put it into practice. Thank you both so much for continuing to share your insights with all of us. Your podcasts are a highlight of my week, and I make sure I can close my door, and give 100% focus to listening to what you have to share. What a lovely comment, Beverly! Thank you! We’re so glad that you find the podcast so helpful.